Please check in and registration at the church. 3:30 p.m. Registration Opens – Please sign-in at the registration table upon arriving and pick up your Ballot. Childcare is NO LONGER AVAILABLE FOR THIS ASSEMBLY. 5:00 p.m. Meal and Fellowship: Tickets for dinner will be available at registration for $8. A taco salad bar with vegetarian and gluten-free options will be available. Pumpkin cake will be served for dessert. The Presbytery utilizes electronic communication for assembly documents. 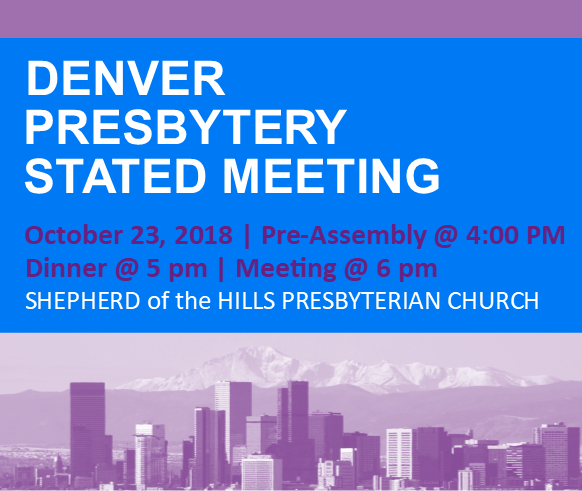 All assembly materials are posted on the Presbytery of Denver website www.denpres.org, click Assembly Meetings tab one week prior to the Assembly. Copies of new materials or critical items will be on the registration table. Previously undocketed business may be presented as new business if a recommended action is placed in the hands of the stated clerk thirty (30) minutes prior to the convening of the Assembly.